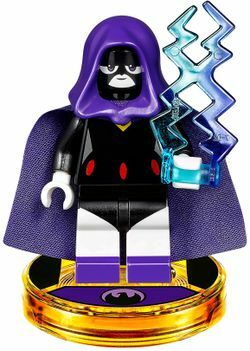 Raven is a character who first appeared in the "Heroines & Villainesses" DLC pack for LEGO Batman 3: Beyond Gotham. She was released as part of 71255 Teen Titans Go! Team Pack in 2017. Raven is the daughter of a powerful demon named Trigon and a human woman. To keep from transforming into a demoness, Raven must keep her emotions under control. When she fears that her father's descent is nigh, Raven seeks help from the Justice League, but Zatanna warns them not to trust her. As an alternative, Raven recruits a new team of Teen Titans by summoning Robin, Wonder Girl, Kid Flash, Cyborg, and Beast Boy to prepare for Trigon's arrival and to battle other threats.